The E46 generation M3 was built from 2001-2006 and BMW sold a staggering 85,000 of the screaming coupes around the world. The sedan versions of the M3 seem to skip generations and the E46 was only available as a coupe or convertible, but it was equipped with a screaming 8,000 rpm capable inline six cylinder engine and a six speed gearbox. 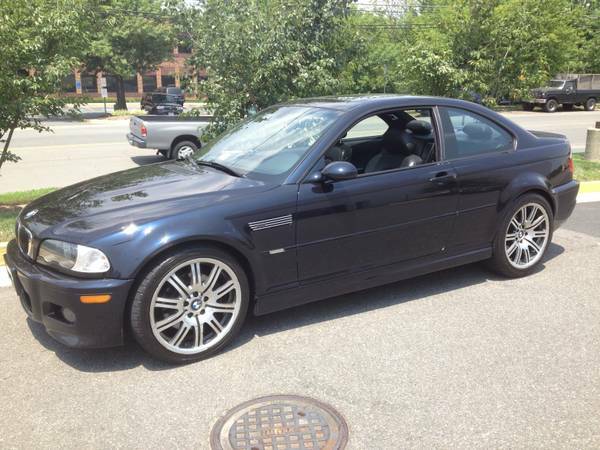 Find this 2002 BMW M3 E46 equipped with SMG trans for sale in Fairfax, VA for $14,000 via craigslist. The heartbeat of the E36 M3 is the S54 naturally aspirated inline six that puts 333 horsepower and 262 ft-lbs of torque into a 6-speed automated manual gearbox. The SMG II transmission was almost identical to the DIY shifted 6-speed except for the addition of an electrohydraulically controlled clutch and shifter mechanism. Driving the early M3 SMG transmission is great at full boil - it shifts fast and furious, but at lower speeds the action becomes balky and is either too slow or too fast. The SMG II is also equipped with a few "easter eggs" including hidden launch control and burnout modes. The E46 M3 is a great car to drive fast and while we prefer the clutch pedal equipped version for our commute, the SMG makes sense for folks who spend more time on track or in traffic. Strange combo eh? BMW sold a staggering 85,000 of the SCREAMING coupes around the world. The sedan versions of the M3 seem to skip generations and the E46 was only available as a coupe or convertible, but it was equipped with a SCREAMING 8,000 rpm capable inline six. I was expecting this piece to end with the statement that at $14,000, this is one SCREAMING deal.